Autism Seminars for Families (previously known as the help! programme) are a series of one-day family support seminars. 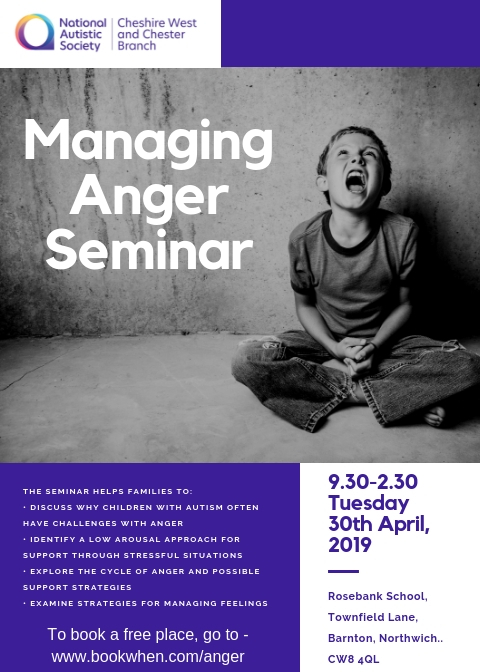 The seminars are for parents and carers of children with autism and Asperger’s Syndrome of all ages and provide information, advice and support. All our events are free to parents, but we would appreciate a voluntary donation of £5 per family as we receive no funding from either NAS or CWaC for our work. The next seminars we are offering can be viewed below. Managing Anger is a one-day seminar from Autism Seminars for Families which provides information and advice to parents and carers of children and young people with autism. The seminar is for parents of children with autism of all ages. These sessions will allow parents/carers to book a face-to-face appointment with Ann-Marie Cotton from IASS, in a private consulting room at our support hub at Greenbank School, Northwich. Parents can book a single 30 minute appointment, or book a double 1 hour appointment, Please book the time slots you need and arrive 10 minutes before the appointment time on the day. Tea/Coffee and biscuits will be provided.